One thing to note about vRO is that you likely already own this product. 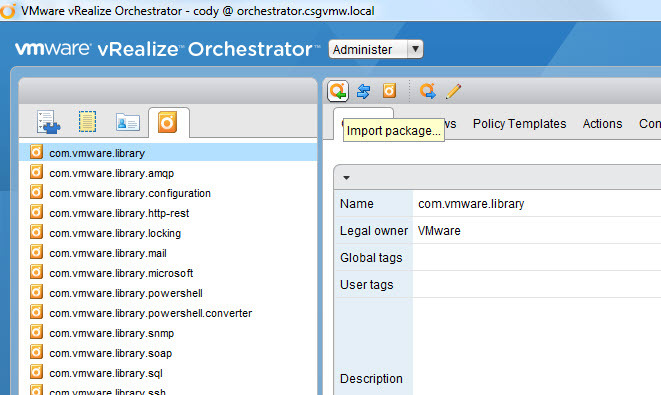 Unlike the other products in the vRealize suite, its license is included with vCenter. 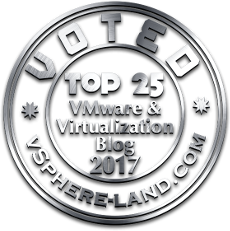 So if you are looking into orchestrating/automating your environment, especially a VMware-centric one, you probably do not have to buy anything, so start looking at vRO. At a high level, what is vRO? vRO is a orchestration tool that operates on the concept of combining various workflows to perform a specific task. Essentially it replaces the idea of writing scripts that you might do today with a GUI-managed set of plugins, workflows and APIs. So, you do not need to worry about what type of API/protocol does this switch support and this storage array and this application. vRO offers plugins like SSH, PowerShell, REST, SOAP and others that can talk to any number of endpoints. Furthermore, many vendors (or the community at large) provide their own plugins to help make it even easier to talk to and manager their products from vRO. A vendor can supply a workflow package or a plugin. A plugin is really a new set of capabilities specific to a type of target or an access method that may not exist innately inside of vRO. 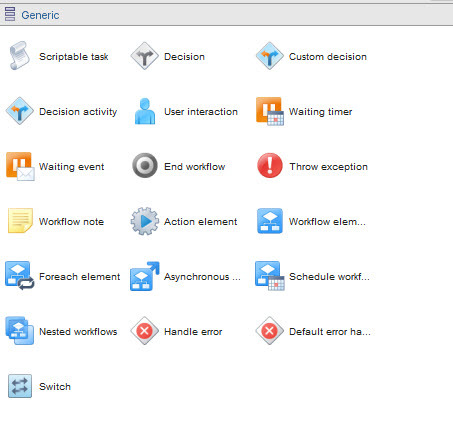 A workflow package is a collection of workflows that use a pre-existing plugin or plugins to do some of the initial work for you on connection to certain objects. So in the end, everything comes down to the workflow. So you might have a workflow that is something simple: format a VMFS volume. 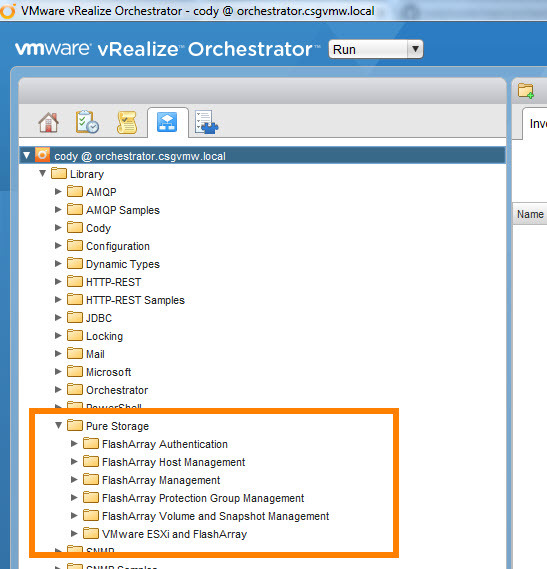 It takes in a device ID and a VMFS name and returns success or failure. Just running that isn’t much of an advantage from an automation or orchestration standpoint though. So, instead, you have that workflow provided by VMware and you have one provided by me, for instance, to create a new volume on the FlashArray. My workflow takes in a name and a capacity and returns the new volume serial number. You can then create a larger workflow that encompasses both. The first creates the new FlashArray volume and then passes the serial number to the next workflow which formats it as VMFS. Inside a workflow can have a whole variety of objects to manipulate and manage the data. It really is no different in concept to scripting. There are foreach objects, decision objects, switches and many more. The workflow package is based off of the HTTP-REST plugin already inside vRO, since nothing besides REST calls are required to connect to a FlashArray. The workflow package is intended as a set of building blocks that you can assemble to build whatever you want. The metaphor I like to use is that we give you the Legos, you make the rocket ship, the pirate ship or something that isn’t a ship (I built a lot of Lego ships when I young). The package covers about 70% of our REST API, anything revolving around host management, volume or snapshots, replication and array information is there. What isn’t currently included are things like certificate management, directory configuration etc. Mainly things most wouldn’t necessarily need to be orchestrated aren’t built in, but they certainly could be with no too much effort. Host Management–creation of hosts or host groups, provisioning storage to them etc. 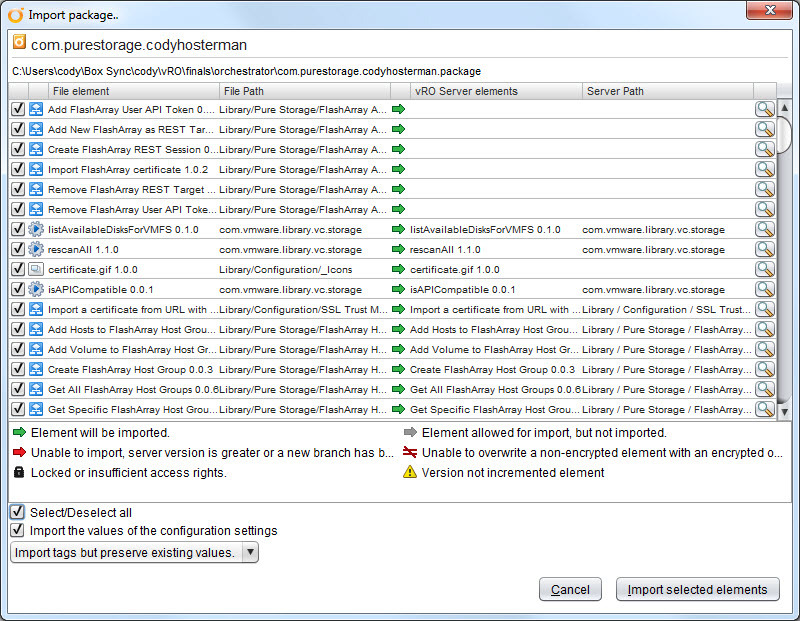 Volume or snapshot management–for creating/changing/copying/deleting volumes or snapshots. 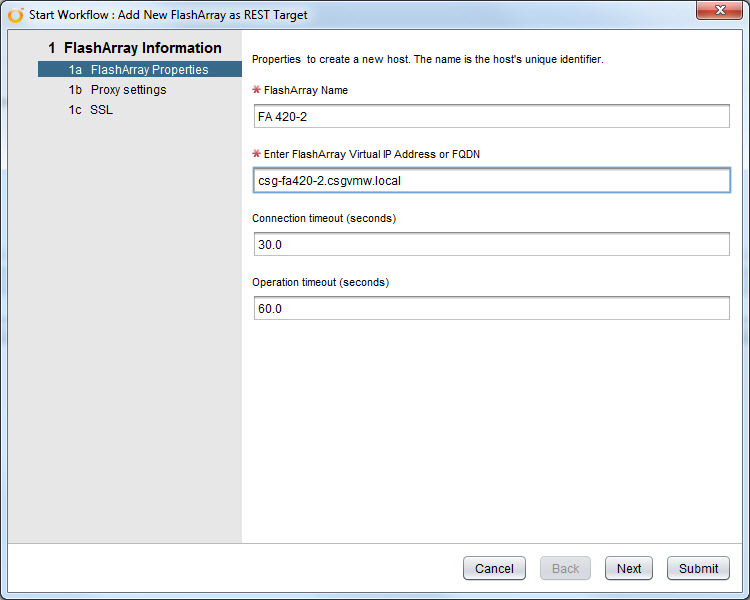 VMware ESXi and FlashArray–example workflows that combines a bunch of VMware and FlashArray workflows. 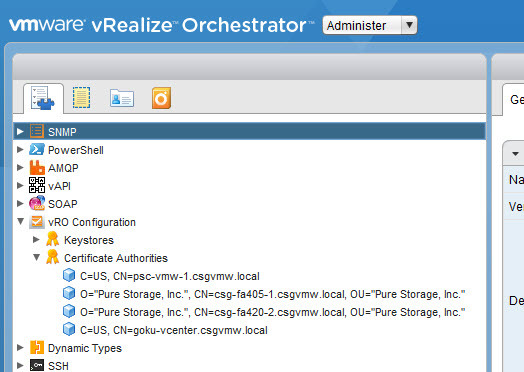 Provision a new VMFS on a new FlashArray volume for example. The individual workflows do a basic thing, they take in a parameter or two, either single values or some comma separated and then convert that into a REST call with JSON formatting and then submit it. The response is received as JSON and is then parsed into a vRO array object that can be easily referenced and passed between other workflows. The main goal is to handle the intricacies of REST for you. 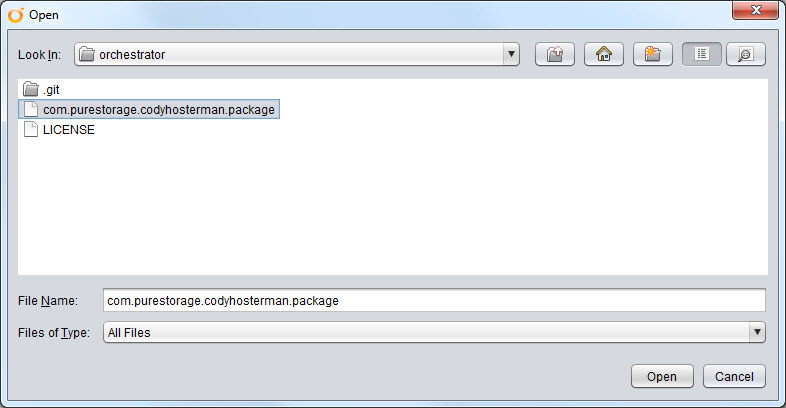 Importing the package is simple. Go to the “Administer” view and click the “Import Package” button. Now, locate the package file and import it. Accept the certificate. If the package or parts of it are already there it will not overwrite them. Otherwise just import it all as new (normal). You will now see all of the workflows available in the workflow view. The first part to understand is that if you just run a workflow it will not work out of the box. You need to connect to a FlashArray first. 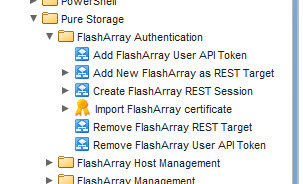 The FlashArray needs to first be stored as a REST object, this requires two steps which only need to be done once (unless the FlashArray changes somehow, like a new cert). 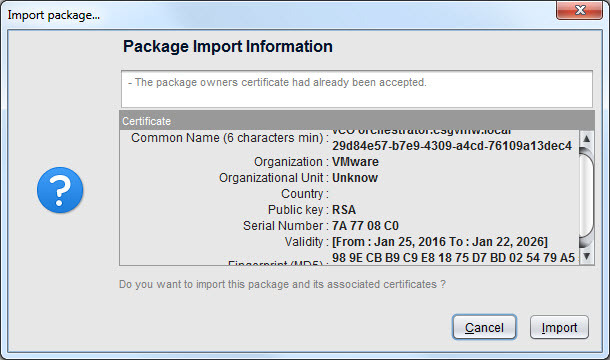 Import the certificate. 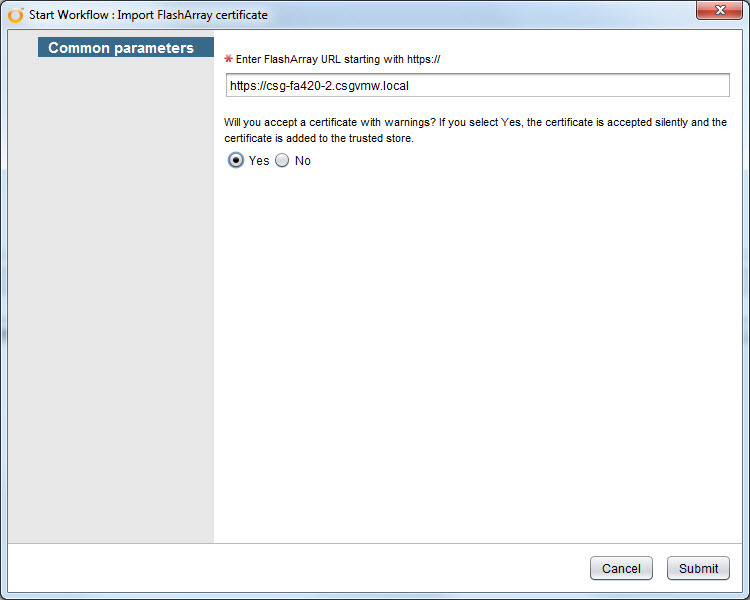 This is a basic workflow that import the FlashArray certificate to the vRO cert store. This must be done first and only once per FlashArray. The next step will be to add the FlashArray as a REST target. This also only needs to be done once per array. Start the “Add new FlashArray as REST target” workflow. In this workflow you add the FlashArray connection parameters, such as a friendly name, a FQDN and some various other options (like a proxy if needed). This is all of the pre-configuration you need to do. Everything else is at the time of connection. Now if you actually want to execute against a target you need to create a session. This might be one or two workflows. If your user already has a REST API token, you just need to create the session, if it doesn’t you need to create one first. This can all be done from vRO or of course in the FlashArray GUI if you want. If your user already has a token you can authenticate a session to run your other workflows. 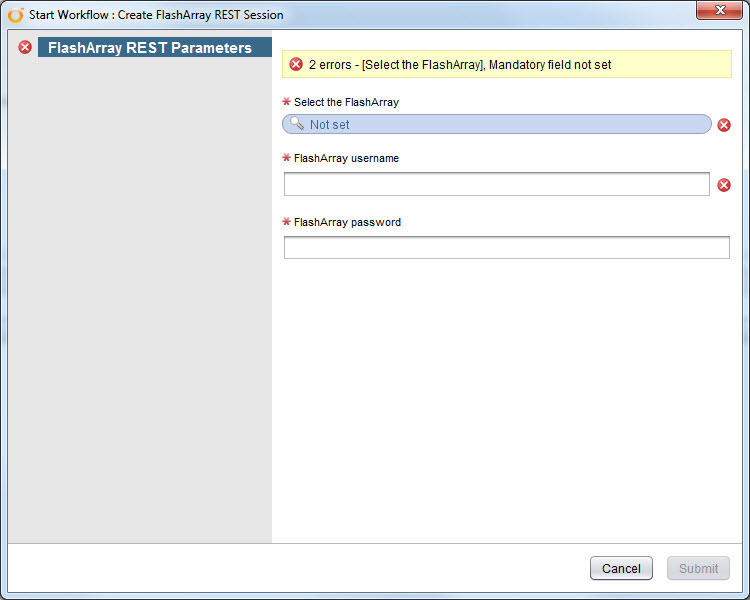 To create a session include the “Create FlashArray REST Session” workflow in your own workflows. That will allow any later workflows talking to that same FlashArray target in the same parent workflow to speak to the FlashArray. Please note that (by default and I will explain this in a later post) these sessions cannot span to other workflows. If you have one parent workflow that has the “Create session” workflow in it, all other workflows in that same parent will share that authentication session. Short story, any workflow you create that uses one of the FlashArray workflows, make sure it includes the “Create FlashArray REST Session” one. You cannot just run the “Get FlashArray Volumes” by itself, you need to put it together in a parent workflow that also includes the “Create FlashArray REST Session” workflow. 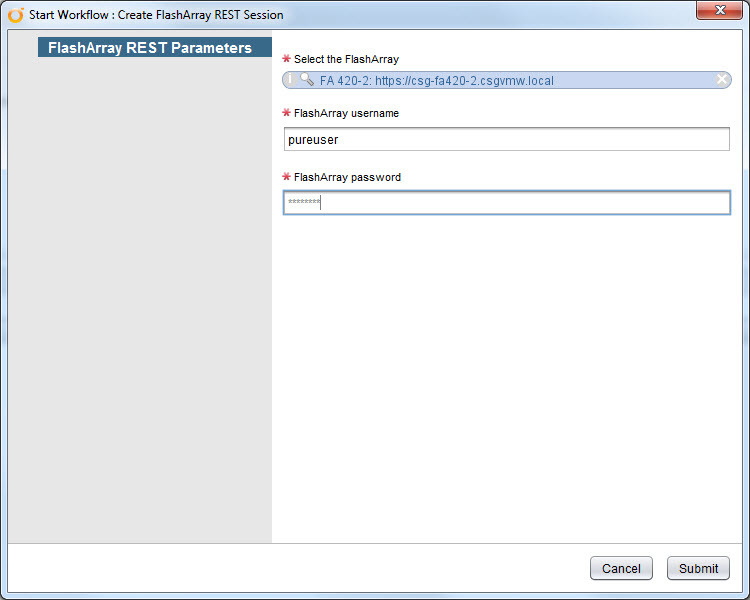 The “Create FlashArray REST Session” requires you to choose your FlashArray target and give your username and password (the password is stored as a secure string). This will perform the API token exchange and authenticate the session. A successful connection will return your username and a session ID. For more color on how this process works, refer to this blog post. Don’t forget to register and come to the Pure Storage//Accelerate conference March 14th and 15th! 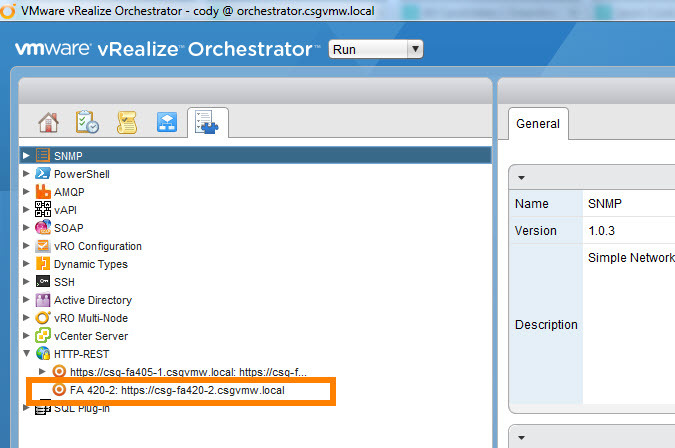 I will be demoing this and more vRealize and FlashArray goodness. Great vRO stuff! One question. On the workflow you have provided entitled “Provision new VMFS from FlashArray”, the coding is geared toward a FiberChannel configuration. Do you have any insight as to doing the same workflow but on the iSCSI protocol? I have imported your workflow. I try to run the Import flash array certificate, it fails and there really is no error code. It has the default Self signed cert that shipped with the Array. All i get is Description: Connection reset. Also on a side note, if i were to replace the Cert on the Array. Do i need to use a public one from verisign / symantec ect. 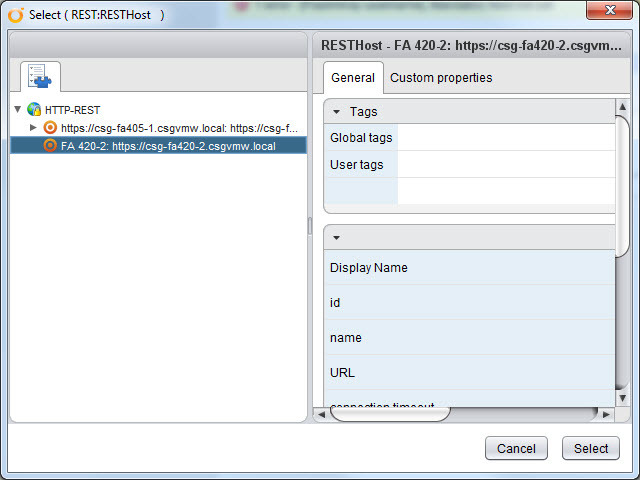 or is it possible to use our Internal Domain CA? It shouldn’t matter, either should be fine. Okay, I have a theory what is going on. Let me run some tests and get back to you. I got this working, I am going to write up a quick post, stay tuned! Worked like a champ Thanks Cody.